Celebrating Jerry Thomas Night at Vessel had become a tradition among the Seattle bartenders. And so with the closure of Vessel and with Jim & Rocky hitting the road to shoot episodes of their BarBack ProAm, many asked "What will we do on Jerry Thomas Night?" Southern California was in for a treat as Jim and Rocky made Jerry Thomas' signature drink, the Blue Blazer, at 320 Main in Seal Beach. 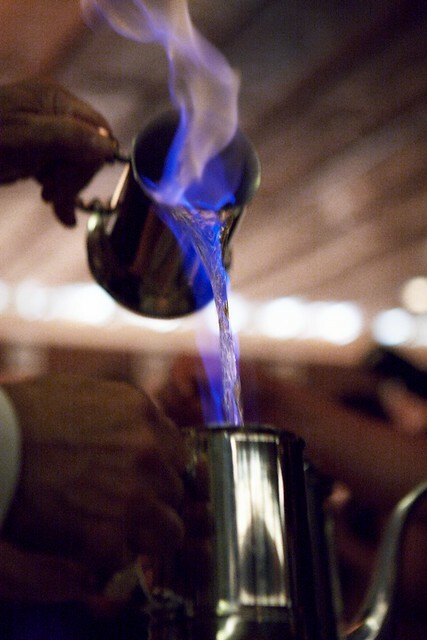 It's done by taking hot water and high proof whiskey (Old Grandad 114 Proof, for instance), igniting the mixture and aerating it for a stunning blue light show between two tins. After wards, a little sugar to sweeten, lemon peel for a garnish, and serve up. "Rocky only has one eye!" "I'm so glad that's not me!" "That's not bad for a rep!" Seattleites aren't the only ones making Blue Blazers. During Jim & Rocky's stop at Bar | Kitchen, some LA bartenders got in on the act too. No video of that, but here's Julian Cox making one at Test Kitchen. And finally, here's the video from last year in Seattle. After a semi-successful attempt at making almost a dozen Blue Blazers simultaneously, the Jerry Thomas Night celebrations continued indoors.